Probably one of the coolest things about hippies is that hippie culture was arguably really only A Thing for a handful of years, yet has continued to have a permanent influence. It unofficially started around 1964 thanks to American novelist Ken Kesey and his Merry Pranksters (some of whom you now know as The Grateful Dead). Their psychedelic and communal exploits - later chronicled by Merry Prankster member Tom Wolfe in "The Electric Kool-Aid Acid Test" - attracted a legion of young adults who, intrigued by the developing psychedelic hippie music scene, dropped out of school and moved to San Francisco and LA to be a part of the "Tune in, turn on, and drop out"movement. Hippies rose to the forefront of mainstream culture in 1967, the summer of which was famously coined "The Summer of Love" thanks to the rise of psychedelic culture, a surge of California music festivals, and heightened protests concerning the US military involvement in Vietnam. The Hippie Movement culminated in Woodstock in 1969, then quickly (as in, only four months later) faded into widespread disillusionment after the tragic deaths that took place at the Altamont Free Concert and the After that, the peace and love of the hippie movement started to slowly decline, first fading with five deaths at the Altamonte Music Festival, and finally deep-diving into disillusionment with the "Helter Skelter" killings done by the Manson Family. But anyway! 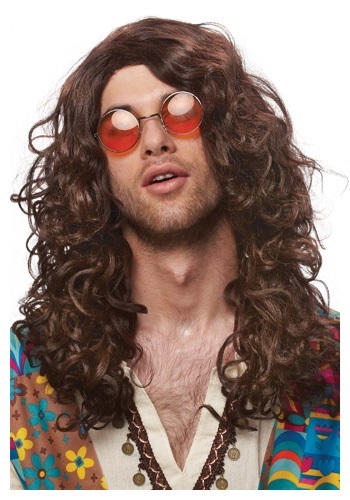 Take yourself back to a more free lovin' time and instantly transform into a flower child with this Groovy Hippie Wig. Add some rose-colored glasses and some clothes that don't match, and you'll be ready to let the rainbows flow free! Great product, looks very real and gets a good reaction from people.